Sacred Heart Parish in Suffern, NY, began the year-long celebration of its 150th anniversary on the Feast of the Sacred Heart, June 24, 2017. Presiding at the evening Mass with his usual warmth and good humor was His Eminence, Timothy Cardinal Dolan, Archbishop of NY, accompanied by the pastor of Sacred Heart, Fr. Matthew Fury, the associate pastor, and many other priests from neighboring parishes. Frs. 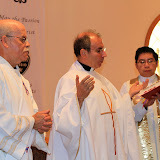 John Gruben, John Oldfield, and Fidel Hernández and a number of lay associates of Tagaste Monastery were present representing the Augustinian Recollects. Cardinal Dolan congratulated the congregation, telling them they looked remarkably well for being 150 years old, drawing one of many rounds of laughter from the people. He also expressed his gratitude for the long-time support of the Tagaste community in the life of the parish, and singled out for particular thanks, Fr. Oldfield, one of several vocations from the parish. The Mass was accompanied by musical selections by the children’s and adult’s choirs and was followed by a “sweet and savory” reception in the school auditorium. The parish will continue with a program of special activities over the course of the coming year to mark this milestone in its history.